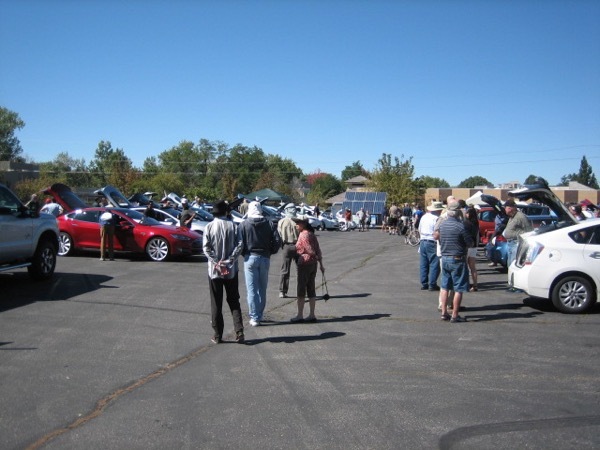 We had a great event with many non-EV driving people attending that showed great interest in EVs. We had many different makes and models of vehicles for people to look at. The Idaho Statesman and Boise Weekly newspapers covered the event as well as two TV stations. Our goal was 50 cars and 500 people. We got close. Next year 100 cars and 1,000 people is the goal! Come see Idaho’s biggest display of electric vehicles - including Tesla Model S’s, comfortable family cars, and electric bikes. Learn how electric vehicles are today’s low-cost local transportation choice, and how you can charge them with home roof top solar panels. There are currently 122 attendees registered. Registered attendees report 380,412 electric miles driven.